St. Kenneth (515-600) who is sometimes called St. Canice or Kenny was born in Ireland and is famous in both Ireland and Scotland. His father was a bard or professional singer of ballads and stories in song. He tended his father's flocks as a young boy. But when Kenneth grew up, he felt that God was calling him and went to Wales to study for the priesthood. St. Cadoc was his teacher and after he became a priest, Kenneth went to visit Rome to get the blessings of the Pope. He then returned to Ireland to study further at the school of St. Finnian where he became good friends with three other Irish saints-Kieran, Comgall and Columba. After preaching throughout Ireland, St. Kenneth went with St. Columba to Scotland on a mission to the pagan King Brude. This made the king angry and he seized his sword to strike the two missionaries. St. Kenneth made the sign of the cross, and a miracle took place. The king's hand was suddenly paralyzed, and the saints were saved. St. Kenneth and St. Columba were always close friends. Once Columba was sailing with some companions and Kenneth was far away in his monastery in Ireland. Suddenly he became aware that Columba was in great danger at sea. He jumped up from the dinner table and ran to church to pray for his beloved friend. Out at sea, Columba cried to his frightened companions: "Don't be afraid! God will listen to Kenneth. Right now he is running to church with only one shoe on to pray for us!" The Lord did listen to St. Kenneth's prayer and they were saved. Although Kenneth and Columba often worked in different places, they knew that prayer is a powerful expression of friendship. 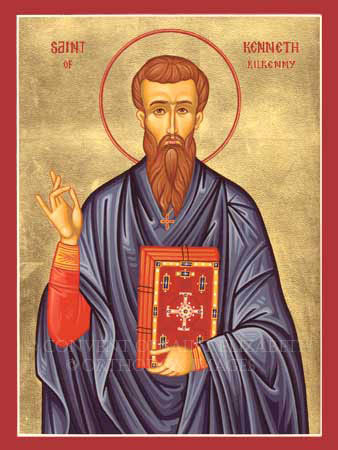 St. Kenneth started several monasteries and converted many nonbelievers. He became famous for preaching the Gospel with much love and joy. Even more, he became well-known for the perfect way in which he himself practiced the teachings of Jesus.